This was my 2nd or 3rd visit to Vijaya Forum mall, and 2nd visit to the Food court. The 1st time I was here with a friend and her son, we headed straight to Sbarro grabbed a few pizza slices and were on our way. But this time, I was here to explore more than just this outlet, to see what more was in store in the Food court. I spotted ID, Moti Mahal Delux, Sammysosa, Kailash Parbhat and few other outlets. The 1st place to try was once again Sbarro. But this time, the pizza was hot and the crust was super thin and crisp. 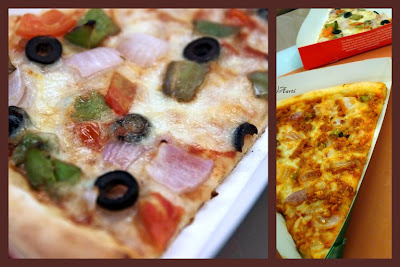 I tried the veggie feast slice while the boys dug into the super spicy Chicken Keema pizza. It was a good pizza, not soggy, not overloaded with tomato sauce. 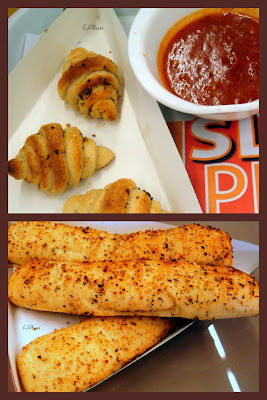 Apart from the pizza slices, we were also given two kinds of garlic breads. One was mini garlic rolls which resembled croissants and the other one was Garlic bread, long soft melt in the mouth bread. It was served with a different kind of tomato sauce, that was cooked with herbs and spices. The veg pizza slices are priced between Rs120 and Rs135 while non veg goes upto Rs170. They also serve pasta and soft drinks. So, if you are not ravenous and looking for a good option, then Sbarro is where you should head.